The Cardiff International Arena (CIA) is a multi-purpose venue, which hosts live entertainment programs ranging from concerts and ice shows to dance and comedy. The CIA is Cardiff's biggest music venue bringing some of the popular performances to Wales. Prominent among them have been Tom Jones, Boyzone, Kylie Minogue and Bryan Adams. 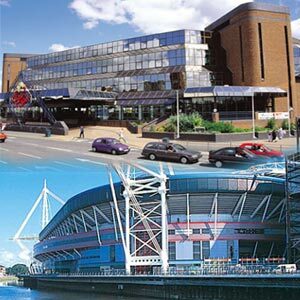 The arena is located in the heart of Cardiff city and conveniently situated for all the city's hotels and amenities making it the ideal venue for event organizers and visitors alike. The 5,000-sq. metre International Arena at Cardiff has a capacity of over 7,500 people and provides a fully integrated event space under one roof. The main arena can offer flexible layouts for nearly 5,000 delegates and banqueting for more than 2,000 guests. In addition, by using the acoustic drape, dual conference and exhibition events can be accommodated within the main arena. The CIA offers 40-function suites that serve as syndicate and catering areas to accompany the main arena and are also perfect for smaller individual events, which include a range of executive boardrooms. The Cardiff International Arena is located very close to the Millennium Stadium, making it an ideal venue for corporate hospitality. The visitor's facilities at the Cardiff Arena are also comfortable. Toilets can be found easily and well maintained. Drinks and food can be bought inside and there are merchandise stands that sell t-shirts and other memorabilia.